When we were thinking about where he wanted to go on our babymoon, we kept a few factors in mind. Michael and I are pretty adventurous travelers, but we didn’t want to risk any unknowns when it came to food and health (especially the Zika virus) so we were somewhat constrained in where we could go. We did not want to be gone for too long or have to get any vaccinations and we wanted to make sure there were quality medical facilities nearby (just in case!) Since I was already in my third trimester, we decided to limit our search to destinations that were within driving distance, rather than flying anywhere. We needed a place with great weather, a combination of exploring and relaxing, and not too far away. Quebec City and Montreal fit the bill! I knew Michael and I would have a great time no matter where we went, simply because we would have uninterrupted time together without having a child to worry about. We rarely get the opportunity to sleep in or take our time eating out at restaurants, so that in and of itself was a treat. But I must admit, Canada totally exceeded my expectations! Both of the cities we visited had so much to offer - rich culture and history, amazing food scenes, and tons of things to do for tourists and locals alike. I also did not realize how strong the French influence is in the region! I thought I’d hear French here and there but that everything would also be in English. I did not expect all of the street and highways signs to only be in French, or for most of the radio stations to be in French, let alone for everyone we encountered to speak to us in French (until they realized we were English speakers) and to see French cuisine everywhere. I told Michael that it felt like we were in Europe without the long flight or the jetlag. We packed in a lot into a few days and seriously had the best time. Keep reading to see pictures and highlights from the trip and to read my mini Canada travel guide! I highly recommend going to French Canada this time of year, in mid August. The temperature everyday was in the mid 70s with no humidity, which was really comfortable for me especially since we did so much walking. We dropped Adina off in Massachusetts and drove straight to Quebec City, which was about a 5 hour drive. A couple of days later, we drove about two and a half hours to Montreal. Although having our car gave us some more flexibility, both Quebec City (at least Old Quebec where we stayed) and Montreal were very pedestrian-friendly and we left our car parked most of the time and walked everywhere. In Montreal, we also took the subway, which was very fast and easy to navigate. We drove straight into Old Quebec, which is rich in historic landmarks and museums. We stayed at Chateau Pierre, a quaint hotel characterized by its English Colonial style in the heart of Old Quebec. The location couldn’t have been better - a short walk to the water, the restaurant and shops in the upper town, and the Petit Champlain neighborhood down below! Bounded by fortifications dating to the 17th century, Old Quebec is rich in historic landmarks and museums. Upper Town contains the 1800s Citadelle fort, the grand Château Frontenac hotel and Terrasse Dufferin, a wide boardwalk overlooking the city. A funicular connects to Lower Town and the Quartier Petit Champlain, with a 1688 stone church, Place Royale square and charming boutiques on Rue du Petit Champlain. When I say that Old Quebec feels like a town out of a fairytale, I am not exaggerating! I found the cobblestone streets, castle-like architecture, flower boxes in every window, and horse-drawn carriages so charming! We were only there for a couple of days but we managed to do a lot! On our first full day, Michael and I went to the Marce Du Viex Port - Old Port Market where there were lots of different local produce stands, cheeses, foie gras stalls, pastries, and endless varieties of berries! On our way back from the market, we stumbled upon a Le Festibiere Beer Festival and although I did not partake in the beer tasting, there were tons of food trucks and other exhibits that were so much fun! Michael loved sampling a bunch of different local beers - who knew there was such a large and impressive beer scene in Quebec?! From there, we walked around Lower Town and the quaint Petit Champlain neighborhood, popping in and out of boutiques and art galleries and sampling gelato and other maple treats. We made our way back to our hotel through the Upper Town, where there were many street performers and caricature artists lining the cobblestone roads. 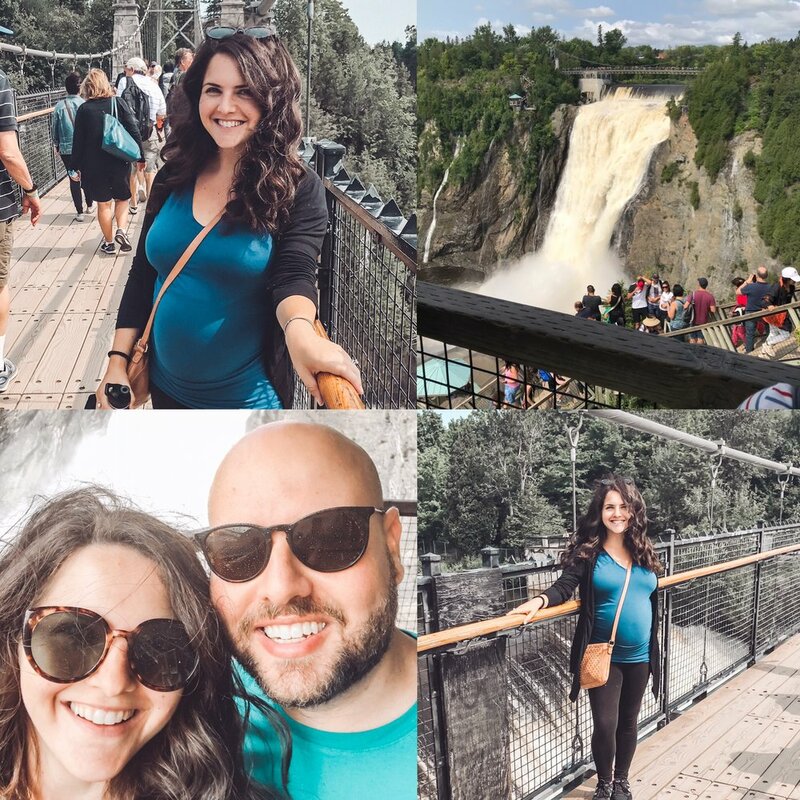 On our second day in Quebec City, we took a day trip to Montmorency Falls, which is about a 15 minute drive from the Old City. The waterfalls are 30 meters higher than Niagara falls and absolutely breathtaking! We opted out of ziplining across the falls and chose to walk across the suspension bridge instead. It was so refreshing to feel the mist on our descent from the falls and got to enjoy a beautiful view of a rainbow on our way down. 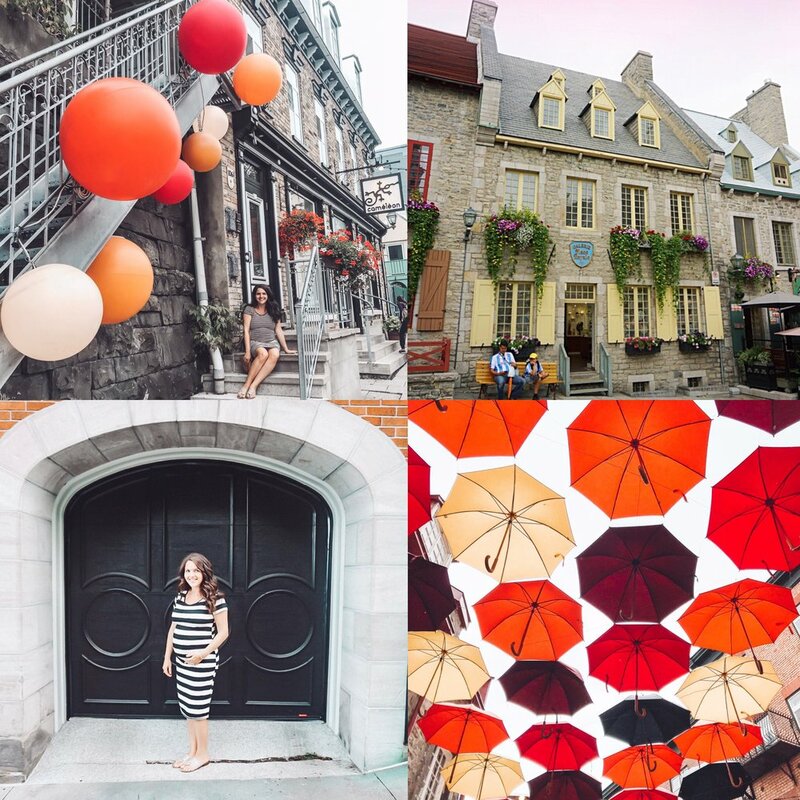 We really fell in love with Quebec City! Between the French language, charming architecture, and the exotic cuisine, it felt like we were in Europe! There is so much more to do, but we loved our few days there, exploring the city by foot and going in and out of shops, art galleries, restaurants. We ate dinner here on our first night in Canada. This restaurant had a bit of a Mediterranean vibe and serves seafood and traditional fare and has a bit of a party atmosphere. It’s located on the main street that leads into the Old City called Grande Allee E where there is one restaurant after another. The best part about it was sitting outside so we could people-watch and take in the energy of the city. Furnished with deer heads on the walls and antler chandeliers hanging from the ceiling, this place serves classic Canadian country fare, complete with gamey meat dishes and hearty entrees. We happened to be staying a few minutes away from here, so we ended up eating dinner one night and brunch one day there. Michael ordered BBQ rabbit “wings” and said it was one of his favorite dishes the whole trip. My highlight was the French Toast with maple caramelized apples, apple butter and “sucre à la crème” caramel. I’m so happy we made a reservation at this place! It was great for a warming meal after an afternoon exploring the city. Located on a cobblestoned street surrounded by pokey shops in the Petit Champlain neighborhood, the farm-to-table food and ambiance were excellent. We were lucky to be seated on the outdoor patio so we could enjoy some live music and people watching from the street nearby. It is very popular so definitely make a reservation or come early to put your name down if you want to dine here. Well located, with views over the river, this Brasserie à la Française is great to have a breakfast or lunch. The staff is charming and they also reimburse the parking ticket (if you stay less than 2 hours) which is pretty cool too. We enjoyed some yummy French-bistro dishes and the beautiful views overlooking the water. Since we had our car, we left early in the morning and drove about 3 hours to Montreal. 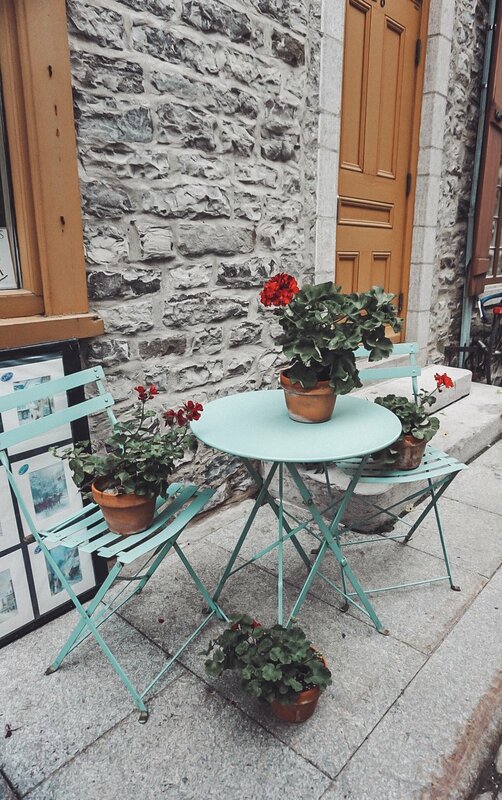 We stayed at a cute boutique hotel called Auberge Du Vieux Port in the Old City of Montreal. I absolutely loved original details of our hotel room like exposed brick walls, exposed wooden beams, and floor-to-ceiling windows overlooking the cobblestone streets of Montreal’s old port. After checking into our hotel on our first day, we went to the top of Mont Royal Park (like the Central Park of Montreal) and looked out over the whole city. The park is HUGE and has lots of trails to walk around and large, open spaces to picnic or hang out with friends. Another highlight of our time in Montreal was visiting the Jean Talon Farmers Market. It was much bigger than the farmer’s market we went to in Quebec City and was full of everything you could imagine! There were stalls with produce, crepes, meats, seafood, cheeses, pastries, baked goods, ethnic cuisines, soaps, spices, teas, lavender, ice cream - you name it! Definitely come with an appetite! Later in the day, we walked around the Mile End neighborhood. This area is where Jewish and Italian immigrants settled when they first came to Montreal and many original food establishments from that era still remain. We did a mini food tour of the area and tried a sesame bagels from Fairmont Bagel and it was sweet and delicious (different from NY bagels, you don’t even need cream cheese) and got gnocchi from Drogherria Fine. Per friends’ recommendations, we wanted to try ice cream from Cem Coba but it was closed the day we were there. Thankfully, we broke up our day of non-stop eating with a lot of walking! I love taking the subway and walking around as much as I can when I travel rather than driving. It’s such a great way to experience a new city and Montreal’s subway system puts the MTA to shame! The subway cars were so spacious and well-ventilated. The station stops were announced clearly in French and English and it was seriously so fast! We probably walked at least a couple of miles down Rue St Denis and St. Laurent. I loved peeking into all of the different restaurants and cute shops. During our walk, I ran into Yanic Truesdale, the actor who played Michel on Gilmore Girls. I recognized him immediately but was too chicken to say anything at first. I finally mustered up the courage to go up to him even though I was nervous. He was one of my favorite actors from the show and he was so nice when I asked him to take a photo - it made my day! We knew that we couldn’t leave Montreal without trying some authentic poutine. They had so many amazing options to choose from including vegetarian poutine (perfect for me!) Michael got poutine with smoked meat - I got with vegetarian gravy, mushrooms, onions, and peppers. We ate yummy ice cream at Mlle Catherine in the Old Port. Had brunch at Tommy in the Old Port The avocado toast was out of this world! All in all, we had a fantastic time! The trip was a the perfect combination of adventure and relaxation and I’m so happy Michael and I were able to have this special time together as a couple! 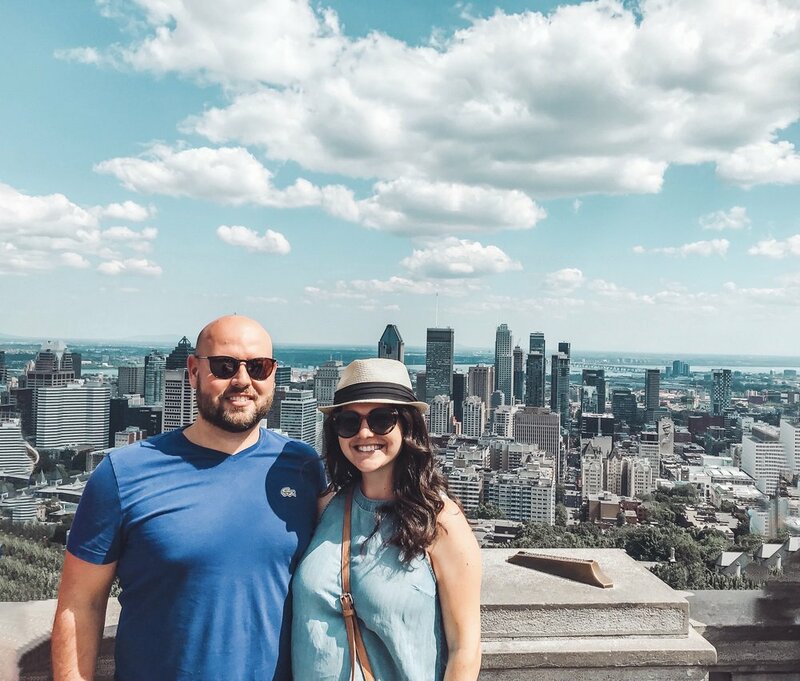 We loved sightseeing in the cute French-Canadian towns, enjoying the delicious food, and taking our time without worrying about a toddler’s sleep schedule or meal time. I hope I inspired some of you to make a trip to Quebec City and Montreal one day! They’re both such beautiful cities and I already can’t wait to go back. What are some other places you’d love to travel to? I’d love to add them to my list! Make sure you check the expiration date on your passport *BEFORE* you get to the USA-Canada border. When Michael and I pulled up to the border crossing, the immigration agent informed us that our passports had expired. I looked at Michael and thought that this man had to be pulling a prank on us. We had already driven nearly three hours by this point and did NOT want to turn around. Lo and behold, Michael’s passport expired last October and mine this past March. We weren’t sure if he’d let us pass through the border, but after asking us a few questions, he let us go. Cue HUGE sigh of relief! While we were in Quebec City, we stopped by the US Embassy to see if we would have any issues on our way out of the country and learned that as long as we had at least one other valid form of US identification (like a driver’s license), then we would be okay. Lesson learned: make sure your passport is valid before traveling out of the country. It was a close call and we will be renewing our passports ASAP!